While most giving projects are aimed at children and adults with “more” giving to those with less, it occurred to us recently that many children living in poverty rarely get the chance to give to others, having so little themselves. 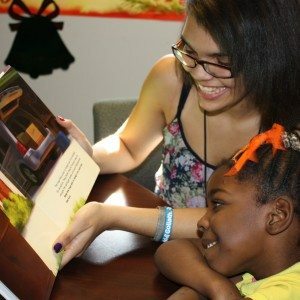 So we developed the GivingWorks Empathy Project, a program designed to give children with “less” the opportunity to be givers too. The older, “giving” kids each choose 4 of the books, decorate and attach a (“This Book Belongs To _____”) book label to each one and put the 4 books into a backpack. They also each address one of the postcards back to themselves (with their name, c/o their school/organization’s address), and it to the backpack. After reading together, the givers surprise the younger ones by writing their names on each of the book labels and share with them that these books are now theirs to take home! Those of us who give of ourselves know how good it feels to “share our bounty”. Through this compassionate giving activity, we hope to provide these “giver” children with that VERY SAME experience. Click here to watch another news piece (NBC Nightly News) about GivingWorks. 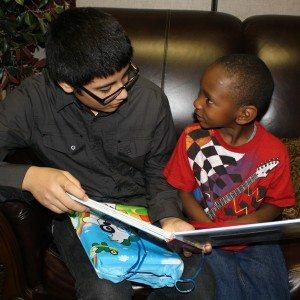 Make your child’s next birthday a “Giving Party” and ask each invited child to bring one book for a child between 4 and 12 years old. 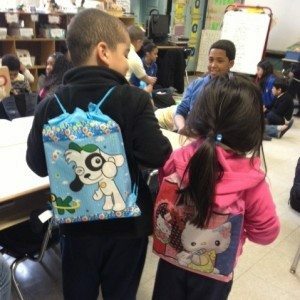 Purchase drawstring backpacks and send them to us at Family-to-Family. Corporate Donors interested in sponsoring The GivingWorks Empathy Project, please contact Pam Koner at pkoner@family-to-family.org. If you’re a teacher, run an after-school program or work with disadvantaged kids and would like your children to participate in The GivingWorks Empathy Project, contact us at pkoner@family-to-family.org. Gina Sobel - Sharpstown High School - Houston Tx. Raqshinda Khan - Bea Fuller Rodgers School - N.Y. N.Y.
“The way a child feels when provided with a concrete opportunity to give to others — the physical act of packing a box, writing a card, wrapping a present for another child — immediately, intimately and powerfully increases their ability to feel empathy for others. — K. Sommerich, CSW, Bronx, N.Y.